As the air outside begins to heat up, finding a cooler that has all of the essential components to keep perishables refrigerated is the main objective. When determining whether or not a cooler is of a high quality, you have to ask these vital questions. How many perishables do I need to keep in the cooler? How many quartz does the cooler need to be? What sort of portability mechanisms will this cooler need to go from Point A to Point B? When taking all of these aspects into consideration, Pelican Coolers definitely take reign as some of the best high end coolers on the market. They share the ranks in the high end category with Orca Coolers and Yeti Coolers. When looking at everything they have to offer you will understand why Pelican coolers are perhaps the best around. Pelican coolers are a prime investment because of all of the pros that all of the ice chests possess. Pelican coolers have a wide range of models that all are unique in their own right, but there are 5 standout coolers that are among some of the most raved about by cooler enthusiasts like myself. The ProGear Elite 65 quart, the ProGear Elite 35 quart, the ProGear Elite 45 quart and the Pro Gear Elite 20 quart are all in the Top 5, as well as the 55 quart Tailgater cooler. All of these models have some state of the art developments that make each one of them worthy of being in the top 5. The ProGear Elite 65 quart and the ProGear 35 quart both have sturdy dual-handle systems, that has both molded-in and hinged handles for multi-faceted carrying options that make carrying as simple as possible for Pelican cooler owners. These also make wonderful marine coolers. The ProGear Elite 20 quart is also a big contender because of some fantastic custom features, such as a built-in bottle opener and integrated cup-holders for the ultimate cooler made for leisure. The ProGear 45 quart has a sloped drain and tethered thread plug where you can even attach a garden hose for environmentally-friendly water conservation. The 55 quart Tailgater cooler is the swiss-army knife of coolers featuring an array of convenient features that puts tailgaters at ease. Between the bottle opener, cup-holders, sturdy wheels, telescopic handle and trays, it is no wonder that this is in the top 5. Made in the USA, Pelican Coolers are very versatile among their various models, ranging from extra-large 150 QT coolers to small compact coolers. When it comes to picking out a cooler, it is also important to think about the level of terrain that you will be on. Will you be on a rocky terrain where a cooler with strong handles would be preferable over a cooler with rolling mechanisms? The Pelican Coolers also have plenty of models that vary in transporting methods and portability. Pelican Coolers are also one of the sturdiest ice chests on the market. Pelican ice chests are made from polyethylene plastic and have corrosion resistant stainless steel hardware that will last you a lifetime. To add on to the durability of Pelican Coolers, they also have bear resistant certification from the Interagency Grizzly Bear Committee. The Pelican ice chests were thoroughly tested in a series of tests using mechanical methods and captive Grizzly Bears. Pelican Products will last you a lifetime, and Pelican even offers a lifetime warranty to back their products. Wherever you find Pelican coolers for sale, you need to have a look at the premium polyurethane insulation that makes users of Pelican coolers rave about the product. When we were first told that Pelican coolers could keep ice for 7 days, we didn’t believe it. However, after leaving a Pelican ice chest full of ice in the hot Arizona sun for a week on our back patio, the ice didn’t completely melt! Out of all of the coolers we have tested, these Pelican coolers beat just about all of them as far as unbelievably amazing insulation. Check out this Pelican cooler review on YouTube. Pelican coolers are made for everything from small two person get-togethers at the beach to massive parties, but which one is the most popular size for standard use? The Pelican Coolers 65 qt is the most popular size among the masses because it is the perfect size for barbecues, camping trips and everything in between. The size is large enough to fit an optimal amount of ice and perishables inside, while still being compact enough to carry easily. The dual-handle system makes it even easier to transport the Pelican Coolers 65 qt wherever you need to. Finding a cooler that is large enough to accommodate a large party, while still being compact to transport and convenient enough to serve its purposes is often impossible. However Pelican perfected the party formula with their Pelican Coolers 150 QT ice chest. The Pelican Coolers 150 qt ice cooler has been dubbed the ultimate party cooler because of its portability and massive size to pack it full of refreshments. The 150 quart cooler is damage proof with molded in tie-downs. Even if you have to drag the cooler, it won’t skid because the cooler features raised feet that feature non-skid technology to keep your floor surfaces safe. Pelican cooler retailers scramble to have Pelican coolers for sale on shelves because they are a guaranteed seller. With all of the amazing features that they have this comes as no surprise. Even some local large retailers such as some Walmart stores and Home Depot carry Pelican coolers because of their popularity. However, department stores and other physical retailers tend to charge full MSRP, which is why the best deals for Pelican coolers for sale are found online. Online retailers sometimes offer a coupon code or incentives like free shipping that will save you some money during your Pelican coolers purchase. In fact, the online retailer that has the best prices for Pelican Coolers on sale that we could find is right here. So what are you waiting for? Join the masses and get yourself a cooler that will last you a lifetime. If you need any more information, you can always check out the manufacturer’s website. If you’re looking for patio coolers, read our outdoor cooler buying guide. When it comes to marine coolers for sale, there are a lot of options on the market today. There are also a lot of features to look for and to consider when shopping for the best boat cooler to fit your needs. The days of the simple, cheap plastic cooler are over, as we have moved into an era of high end coolers made from the latest advancements in both materials and design. Below we will go over those features, as well as give you our list of the top 5 best boat coolers for the money. We’ll start you out with our list of the top 5 best boat coolers on sale, then we will provide brief boat cooler reviews on each of them. Below you will find brief boat cooler reviews for our top picks, along with links to additional reviews. Let’s start with what we feel is the best marine cooler for the money – the Coleman Xtreme Marine cooler. Some have called this the “poor man’s Yeti”. We tested Coleman’s claim of 5 day ice preservation and we found this claim to hold up. If you put ice in the Coleman Xtreme Marine cooler on Monday, there will still be some left on Friday. Very impressive for a cooler in this price range. The Coleman Xtreme boat cooler also features an antimicrobial additive which helps eliminate odor-causing bacteria growth in or on the cooler. Additionally, this boat cooler has a UV inhibitor to protect the color of the cooler even if you leave it out in the sun for extended periods of time. You really won’t find a better boat cooler for the price. Read more reviews. The Igloo Marine Utra cooler is a cooler that many people are familiar with, and the Igloo brand is a name that many folks trust. Igloo has been making coolers for quite some time, and the Igloo Marine Ultra is one of the most popular marine coolers for sale. Offering a UV protective coating, comfort-grip handles, and sturdy construction, the Igloo Marine Ultra is certainly a great boat cooler for the price. Made of an extra thick insulation, the Rubbermaid Marine Cooler can maintain ice for up to 7 days at temps of up to 90 degrees. If that’s not impressive, we don’t know what is. This boat cooler has enough room to seat 2 adults on it’s lid, and also has a built-in fish scale for easy measuring of that trophy catch. The Rubbermaid Marine cooler is made right here in the USA, so you know the quality will be top-notch. More of this boat cooler’s reviews are here. When considering a boat cooler, price is also a determining factor. The Pelican ProGear Elite cooler is a high end cooler that would hold up well to just about any situation you may find yourself. We have done a Pelican ProGear Elite review ourselves, so we know that this is a top quality cooler. However, we also understand that not everyone has the budget to afford such a high end cooler. But, if you do, you really won’t have any regrets about choosing the Pelican ProGear Elite. Read more reviews. The Yeti Tundra cooler is another high end cooler which is out of some folks budget. However, much like the Pelican, Yeti’s quality is hard to beat. 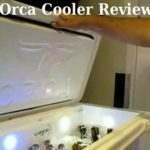 Some say the quality of the Orca cooler comes close, but we’ll let you decide. 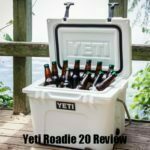 Be sure to check out our full Yeti Tundra cooler review. You can also find more reviews here. When looking at the marine coolers on sale today, you need to consider things other than simply longer ice retention times. That’s certainly important in a marine cooler on sale, but you also need to consider the following. Marine coolers will naturally be out on the water and in the sun more so than your standard outdoor cooler, so it should be rust resistant, UV resistant, and able to withstand the harsher marine elements. This means that any metal on the cooler, such as hinges or screws, should be made of quality stainless steel. Additionally, marine coolers on sale should have odor resistant properties, since you may be storing fish or bait in it on occasion. Marine coolers with wheels offer greater portability. A marine cooler with wheels also will save your back, as you won’t have to carry a heavy cooler around. Other nice to have features found on some marine coolers are a measuring area, or ruler, on the cooler lid. This comes in handy for quickly measuring fish. Slip resistant feet on the bottom of a marine cooler provide extra stability on wet, slippery boat surfaces. Some marine coolers have a slip resistant pad on top, which allows you to stand on while fishing, and other marine coolers have seat cushions on top. These are all convenient features to look for when looking for a marine cooler for sale. As you can see, the features available on boat coolers differ greatly from other coolers, such as patio coolers. Whichever of the coolers above you decide to purchase, you truly can’t go wrong.